Regulatory guidance requires that banks perform their own due diligence reviews, and demonstrate an independent credit decision, when entering into third-party loan arrangements such as the participation opportunities offered by Centrant Community Capital. Recent conversations with several member banks, as well as with OCC staff in Charlotte, suggest that regulators are paying particularly close attention to how banks fulfill this mandate. To better assist you with meeting regulatory expectations, we have begun providing a link in our participation announcement e-mails that will allow you to access and review key underwriting documentation. We are also exploring several options to make our regular financial monitoring reports available to you at all times, rather than upon request. Finally, we recommend that you review your institution’s policies and procedures governing loan participations, to ensure that they outline risk-appropriate requirements for underwriting, approval authority and any commitment thresholds or concentration limits. While specific policies and procedures should be tailored to the particular needs and capacity of your bank, we are happy to provide guidance and suggestions on best practices you should consider. 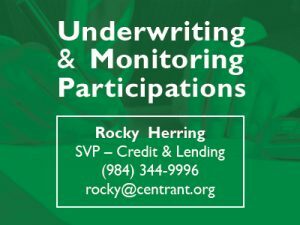 For more information, please contact Rocky Herring, SVP – Credit & Lending at (984) 344-9996 or rocky@centrant.org.